7:00 p.m. Thursday June 15, 2017. Various Positions for Community Disability Services Workers: Supporting adults or children in various settings. These positions include evening and weekend hours. We prefer directly related education in Disability or Human Services. We will consider a relevant background of education and/or experience. The successful applicants will receive on-the-job training. Wage rates are based on education and experience. WIN offers an excellent benefit package for part time and full time positions, including health, dental, vision care, best doctors, shift premiums, employer-paid RRSP as well as other benefits. Individuals with disabilities in Westlock have a plethora of options available to them to live as independent a life as possible. One of the most visible of those options is the Westlock Independence Network (WIN), which has been serving clients with various disabilities in the community since 1988. WIN is a private, non-profit charitable organization, said executive director Greg Morris, and provides services based on what its clients need, whether that’s full-time, 24/7 care, or only checking in on the client a few times a year to keep on top of a particular issue. WIN’s clients have myriad types of disabilities, including developmental disabilities, physical disabilities caused by brain injuries, physical disabilities caused by diseases like multiple sclerosis, and physical disabilities caused by physical injuries. “The only population we really haven’t served is people whose primary or only disability is a mental illness,” Morris said, adding some clients have a mental illness in addition to a disability, but not solely a mental illness. The organization has many ways it assists its clients to live independent lives, including going so far as to enter the real estate market. Morris explained WIN owns a house specially designed for people in wheelchairs, with lower countertops and cupboards, as well as a regular house. A lot of WIN’s time and effort is dedicated to risk management and risk reduction. To that end, the organization has embraced technological advances to better monitor its clients to ensure they are safe. For example, he said WIN provides a locking dosette, or daily pill dispenser, that only opens when the client is supposed to take his or her medication. When the time comes, an alarm goes off and won’t shut off until the medication is removed. If the medication is not taken within a specified time frame, emergency contacts are called to check in on the client. Another system is New Brunswick-based TeleCare, a manned, home-monitoring system that provides services like stove monitoring, home temperature monitoring, flood detection and fall detection. However, Morris acknowledged that no matter how much you work to eliminate risk, bad things are going to happen. And when they do, it’s important to have plans in place to follow in the event of an emergency. For example, he said WIN runs regular fire drills, and provides its clients with tools like fire extinguishers, smoke detectors and carbon monoxide detectors. 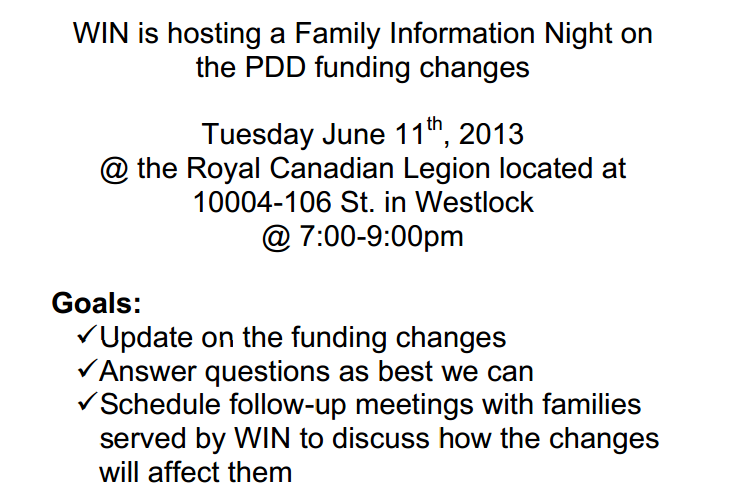 WIN receives funding from the provincial government, but there is not one, single source of that funding. Instead, the funding comes from a different department depending on whether the client being served is a child, an adult with a physical disability, an adult with a brain injury or an adult with a developmental disability, among many possible avenues. People can get involved with WIN through either visiting the office themselves, or being referred by such community services like doctors, Family and Community Support Services or Alberta Works, Morris said. Once in the door, WIN staff will guide them along. Once approved, WIN will pay all the costs involved in working with the client, using the funder’s money. For a client, their costs will be “the same costs they would have if they weren’t using our services,” Morris explained. 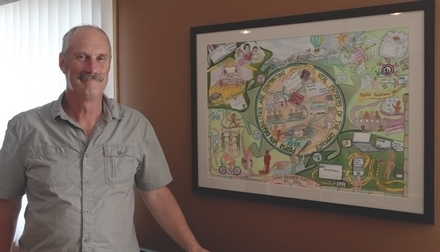 WIN came into existence in 1988, and was initially an offshoot of Blue Heron Support Services in Barrhead. Morris explained its genesis was in part because there were a lot of people who were covered for services as they went through school, but once they graduated there was nothing for them. So, WIN was created to fill that void, and has been doing so in the Westlock community for 26 years this coming November.